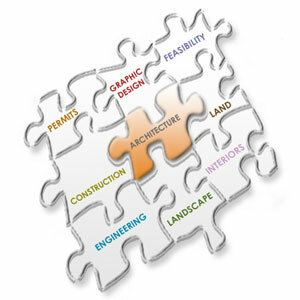 Architecture is only a piece of the puzzle - it takes all types of trades and services to complete a project. Our value as your architect goes well beyond that of building designer. We believe in developing a strong project concept and carrying it through all aspects of the project, from conception to building completion and beyond. The following services enable us to provide a one-stop-shop for our clients. Great projects begin with a clear vision. We can help you develop that vision and match it with preliminary building layouts and financial feasibility. Don't have property yet. No problem. Our team of real estate professionals and architects can find the land to match your project requirements. Successful projects have a certain cohesion. Everything feels intentional. Signs match the architecture. Logos and packaging enhance the experience. You get the picture. Buildings can't stand alone. Let us enliven the inside and outside of your project with furniture, color and eco-friendly landscaping. Buildings need people. People to buy them, use them, and buy things in them. This doesn't happen automatically. We'll help you get the word out. Contact Modative to learn more.